Not so long ago, an intrepid editor named Phyllis Irene Radford saw a documentary on how beer appears to be critical to the rise of human civilization. It inspired in her the desire to see what authors could do with that brainteaser. This prompt led to not one, but two anthologies of stories that fall into the genre fiction world, many with humorous elements. How Beer Saved the World 2 went live today, including a short story I wrote specifically for this anthology. My story came with a larger world I may explore in depth at some point. A Magical Brew is a fantasy short story with an epic-level crisis in effect, and yes, it centers on beer. Like most of my fantasies–though it has elves, a tavern, and even mention of dragons–A Magical Brew takes a sideways look at the conventions in what I hope you’ll find to be an entertaining tale. I’m looking forward to reading the thirteen other stories in the anthology, and from perusing the TOS, I can tell they’re going to be fun. I can’t wait to see what everyone thinks of this collection, so if you snag a copy, please consider leaving a review. 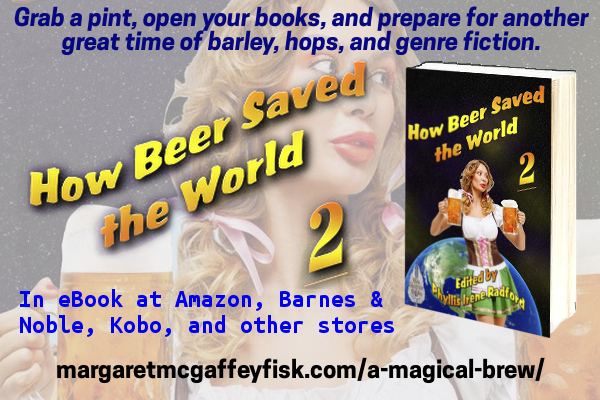 You can pick How Beer Saved the World 2 up in Kindle mobi or ePub at the following vendors. A print version and other stores may be in the queue. If the inspiration catches your fancy, check out the first volume as well at Amazon and other book retailers. Also, if you’re curious about the Discovery Channel documentary, it’s here on Vimeo. Please help share the news and let everyone in on the party. You can use the above image if you’d like.